let’s call it baby fat. This isn’t all that unusual for pitchers. Some of the best hurlers of all time weren’t exactly chiseled, relying on thick lower bodies to drive off the mound and generate velocity. Still, one look at a young King Felix and you knew some impressive banquets had been held in his royal court. and finding little to no change in performance. Baseball Prospectus did a study and found a slight (3 percent) uptick. Hernandez has been one of the best pitchers in baseball in each of the past three years, weight loss may or may not make a difference, and a sample size of one game means next to nothing. But damn, dude was dealing in Tokyo. He got into a spot of trouble in the first, allowing a sharp single to Jemile Weeks to start the inning. Weeks stole second, then moved to third with two outs on a groundout. That’s when Felix unveiled his full repertoire. He got ahead on a mid-90s fastball that Seth Smith could merely foul off weakly. Then, with two strikes, Felix went to what might be his best pitch, a wicked changeup that dived under Smith’s bat for strike three. He cruised from there, setting down the A’s in order in the second and third, scattering five hits, striking out six and walking none over eight dominant innings. It was the kind of performance that makes Mariners fans wish Felix had more of a supporting cast, and makes (some) Yankees fans dream up ridiculous trade suggestions to call in to WFAN. He wasn’t the only Mariner to make an impact. Native son Ichiro got a warm ovation when he came to bat with two outs in the bottom of the first. After working the count full, he made one of his trademark slashes at the ball, chopping it into the artificial turf, a mile over A’s starter Brandon McCarthy’s head and into Cliff Pennington’s glove, where it stayed for an infield hit. It was the first blow in a vintage Ichiro day: two infield hits, a bloop single to center, and a run-scoring single in extra innings, the only out coming on a sharp liner to left. In the first 10 years of his career, Ichiro netted 4.5 or more Wins Above Replacement nine times, establishing himself as one of the best all-around outfielders in the game, and one of baseball’s most unique players. But his infield rate fell to the second-lowest level of his career and his batting average on balls in play to the lowest, eating into his offensive value; a concurrent drop in his defensive numbers suddenly turned him into a replacement-level player last year. The Mariners dropped him to third in the lineup, where hitters are typically called up to drive the ball for extra bases. But if Ichiro returns to the .330 slap hitter he once was, you have to figure no one will complain. Seattle’s other offensive hero was Dustin Ackley, the 2009 no. 2 overall draft pick playing his first full season in the big leagues. Ackley launched the first homer of the season, powering the ball over the wall in right-center. 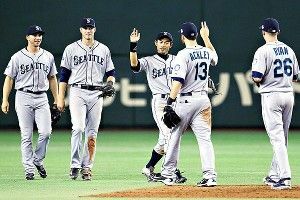 Then, in the 11th, he rapped a single ahead of Ichiro, breaking a 1-1 tie and propelling the M’s to a 3-1 win. Unlike Ichiro, who’s been known to occasionally show off his sleeper power in batting practice only to holster it during games, the 24-year-old Ackley has a chance to develop more pop with age and experience, something the Mariners sorely lack. As beloved as Ichiro is in Seattle, it’s Ackley and Hernandez who are the franchise’s cornerstone players at this point. Considering how many whiffs the M’s have had in the first round of the draft (Jeff Clement, Ryan Christianson, Josh Fields, and the immortal Ryan Anderson — albeit after finding historically great success with the likes of Ken Griffey Jr. and Alex Rodriguez), it’d be nice to see a high pick develop into a true star player in the majors. For the A’s, it was a continuation of last year’s themes. Magazine cover boy Brandon McCarthy harnessed an impressive cutter and his more conventional fastball-curveball offerings to keep the Mariners at bay for seven innings, in between random Lenny Kravitz riffs and ’90s hip-hop blaring over the Tokyo Dome PA system. Final line: six hits, one run, three strikeouts, no walks, and the one Ackley solo homer to account for Seattle’s pre-extra-innings scoring. In fact, neither team drew a single walk in 11 innings, a tribute to the day’s pitchers (including Mariners setup man Tom Wilhelmsen, who fired two shutout innings and earned the win, after racking up just 34⅔ career innings prior to this year) as well as the tendencies of some A’s hitters and many Mariners hitters (28th last year in walks). One Oakland hitter who looked particularly lost at first was Yoenis Cespedes. On the first pitch he’d ever seen in the major leagues, Hernandez fired a fastball toward his ribs, knocking him off the plate. Then the King went to work. First, a changeup that nicked the outside corner for strike one. Then, a hellacious 12-to-6 curveball that disappeared under Cespedes’s bat for strike two. Finally, another change, this one scraping the dirt and getting Cespedes to chase for strike three. Hey, it happens when you face Felix. But Cespedes got his revenge later in the game. After getting hit by a pitch in the fifth, Cespedes worked the count to 1-1 against Hernandez leading off the bottom of the seventh. Then he got a sinking curveball, reached down, and crushed it over Michael Saunders’s head in center, cruising into second with a double. It was the kind of display that reminded everyone of the Greatest Training Video Ever Made, and that Cespedes might have the raw talent needed to become the star player the A’s desperately need. It was also the kind of delightful small-sample overreaction that makes Opening Day so great.